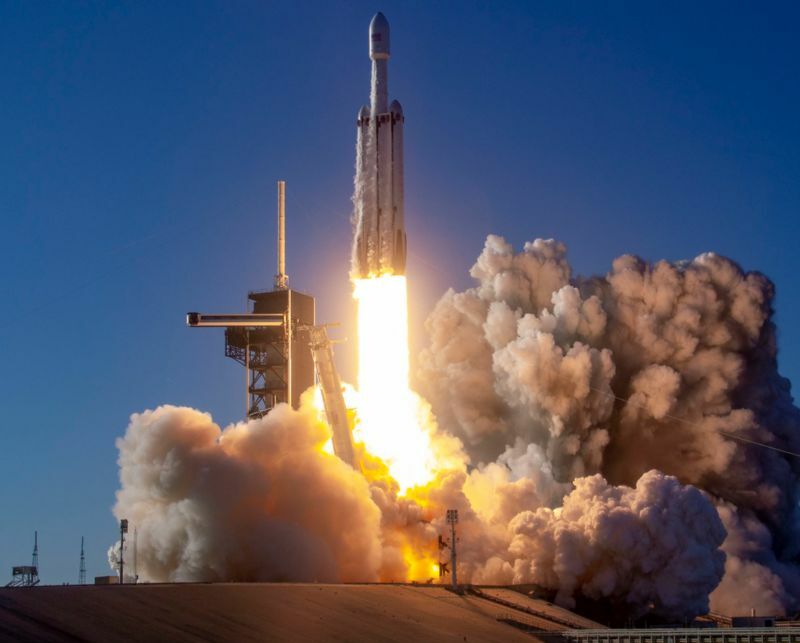 I flew to Florida to witness in person the awesome power of the Falcon Heavy. My viewing location for the launch of Arabsat 6a was Banana Creek within the Kennedy Space Center, also known as “Feel The Heat” in KSC’s launch viewing nomenclature. It is 3.9 miles due West of the launch pad, as close as one can be for such a launch. I do not want my recollection of this experience to become clouded with time, so here are my notes. I traveled alone for this event and I expected to be alone most of the time. Boy was I wrong. I had many wonderful conversations with other space fans. I met a lot of people from different walks of life, and from many places further than my home in Nashville. Some I met in person after communicating on a Slack channel connected to the /r/spacex subreddit, but most were other excited space geeks who were waiting in line for a bus for the umpteenth time. Apart from the FH launch, other big space events were happening: the first photo of a black hole was revealed and Beresheet was scheduled to land while we were waiting for launch. We all followed the progress of the Israeli lander while sitting in the bleachers and commiserated when word of its demise came through. The bleachers are so stocked with space nerds that when I wondered what Beresheet had launched on I asked the person nearest me and got an immediate answer: it was a Falcon 9. Where else can you ask that question to anybody and get an answer? As the countdown clock ticks past milestones, the crowd begins to react more and more excitedly. At the 1 hour mark big cheers erupt. Each time the announcer mentioned even the vaguest possibility of a scrub, he would elicit boos from the crowd. We’re all passionate, excited and jittery in the bleachers. It makes for swift and audible reactions every time something happens. A puff of oxygen emanates from the rocket? Wild cheers. The announcer reminds us that they will scrub if they notice anything wrong during the last second of the countdown? Merciless booing. It is hard to sit across the water from pad 39A and not think about its history. Every person who walked on the moon launched from that same chunk of concrete. It’s remarkable to think that humans boarded a ship in this location and sailed across the vast expanses of space to reach another rock to call home. I noticed the moon hanging directly over 39A and the symbolism was perfect. A vast expanse of featureless sky between a rocket pad and its destination. Original idea for this sequence of photos from this tweet. 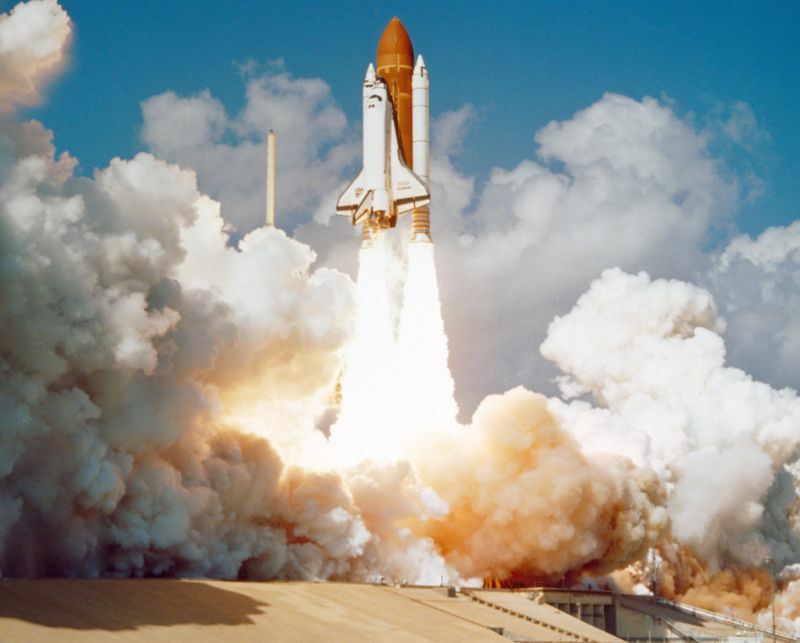 Soon, if all goes according to plan, US astronauts will launch into space from US soil aboard US rockets for the first time since the end of the Space Shuttle. They will do so from 39A. This is the thing most people wonder about. Home speakers or even good headphones can’t replicate the sound in your living room, so what is it really like? It begins with silence. It takes 18 seconds for the sound to travel from the pad to your ears. When the engines are lit, an immense angry cloud jets out from the side of the launch pad signaling the beast has awakened. However there is no sound. The Heavy lifts off and climbs. Still no sound. 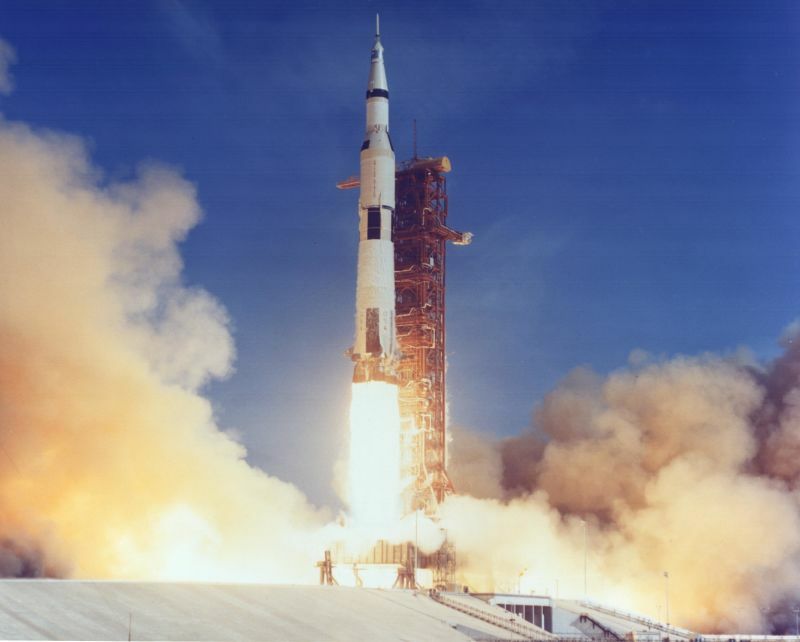 A rocket can travel a long way in 18 seconds, and I began to feel a real disconnect between what I was seeing and what I was hearing. We had been told it was possible to see the sound waves coming across the water. 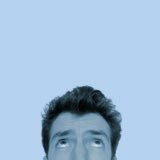 I saw no such thing. My first indication of sound was this sense of deep motion in the air, the lowest deepest notes I can imagine hearing. It’s a soft, pleasant experience that soon gives way to an ever increasing roar. Finally, things sound like they are supposed to. The roar sounds just like just what it is: an immense amount of energy unleashed all at once. It builds gradually in intensity while dropping in pitch (due to the Doppler effect.) It’s a roar that you can feel in your chest, and that is why headphones can’t replicate the experience. It then begins to crackle and pop. I used to think the crackling of rockets in launch videos was due to limitations of the recording equipment. It turns out it’s the physics of the atmosphere. Imagine a loud thunderclap. Now imagine that sound in a continuous loop. You’re getting close. Then, very quickly, it becomes quiet again. The Heavy accelerates away so fast that it doesn’t take long for it to go out of earshot. Once the rocket cleared the tower and the plume was in full view, I felt like I was looking into the sun. It was so bright my eyes instinctively wanted to look away. But we had waited 6 hours for the launch to go off the day before, and 4 more hours today in addition to all the bus lines, so when that rocket finally made itself visible I was not going to look away. Too bad for my retinas, let ‘em burn. I am not taking my eyes off that rocket. I have watched many webcasts of SpaceX launches and they are a great way of following the action and getting a taste for the excitement from home. However to see it in real life brings a new dimension to the event. It becomes less about zoomed in views and performance data, and more about the vast expanses, the palpable speeds and dizzying altitudes. We were able to see the different elements play on the vast stage that is the sky in one continuous take. Launch! Much excitement. Once it clears the tower the rocket plus its giant plume makes for a satisfyingly large and shockingly bright thing to look at from Banana Creek. Sound is finally getting to our ears. The rocket is accelerating and is starting to turn downrange, meaning we see less of its side and more its tailpipe. It’s an impressive sight, like a three-eyed Sauron. Aw shoot. 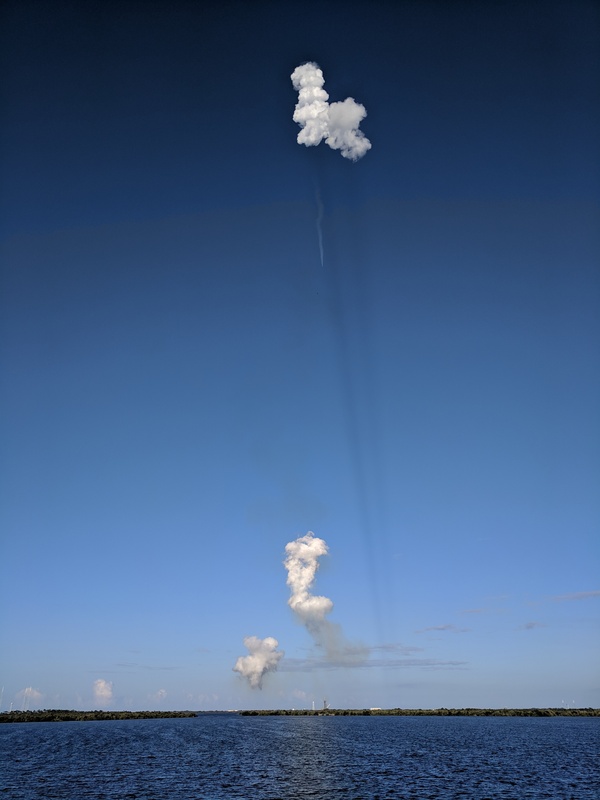 We launched into a perfectly clear sky, but the rocket created a contrail that grew into a cloud, hiding itself from our view. Last we saw it, it was headed straight away from us. It’s quiet in the bleachers. Surely the party’s not already over, is it? 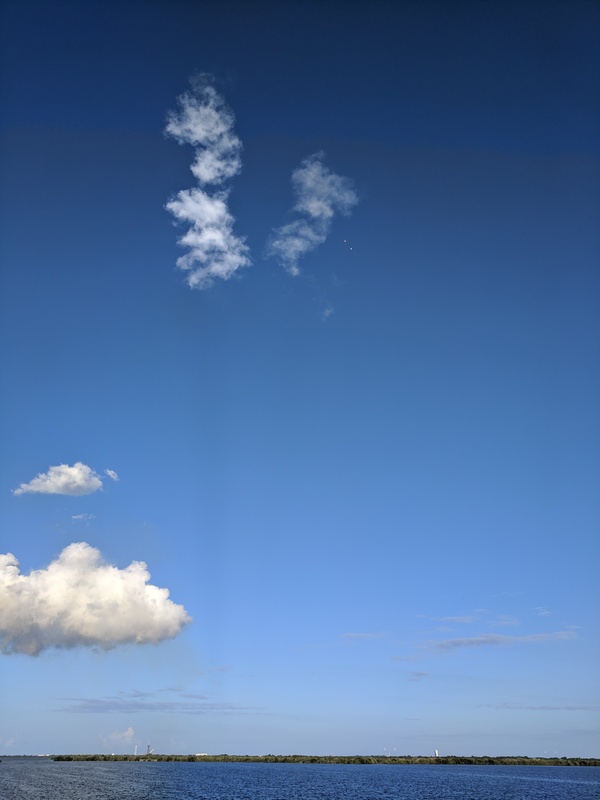 Falcon Heavy reappears below the cloud as a wide orange triangle. Wild cheers from the crowd. It is below the cloud because it is now heading more away from us than up, like an airplane headed for the horizon. The plume has grown so much in the rarified air that we still see it as a distinct shape. It quickly gets dimmer as the rocket accelerates away from us. Booster separation! By this point we’re really straining to see clearly, but I did see the boosters separate as two little sticks that fell off to each side. After a few more seconds we could see the two additional smoky plumes from the boost-back burn. As soon as that burn ended we lost sight of the side boosters. By the time the photo was taken the center core was accelerating fast away from us and about to disappear for good. At 6 minutes and 11 seconds after launch the re-entry burns were going to start so we all trained our eyes to the sky, taking our best guess as to where the two boosters would appear. Somebody yelled "there!" and we all looked to see where that person was pointing. Two bright yellow dots were plainly visible to the right of the cloud. 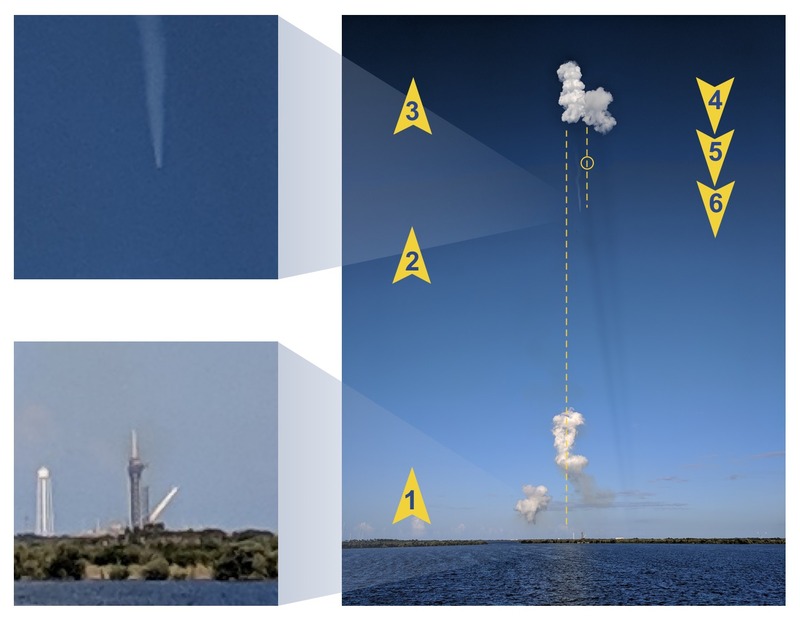 The reentry burns are short but they allowed us to spot the returning boosters. I was able to follow them all the way to the ground. They were mere specks at first but became more discernable as they dropped. Holy moly, these things are cooking. I remember being awed by the speed of the two objects I was looking at. Seeing them plummet from such an altitude really brings home why rocket landings are such an extraordinary feat. The landing zones are much further away from Banana Creek than the launch pad so the landing burns appear as points of light. This is too bad, but you can either be close to the launch or close to the landing. I lucked out: my spot in the bleachers allowed me to follow the boosters as they squeezed just between the VAB and the tan building. 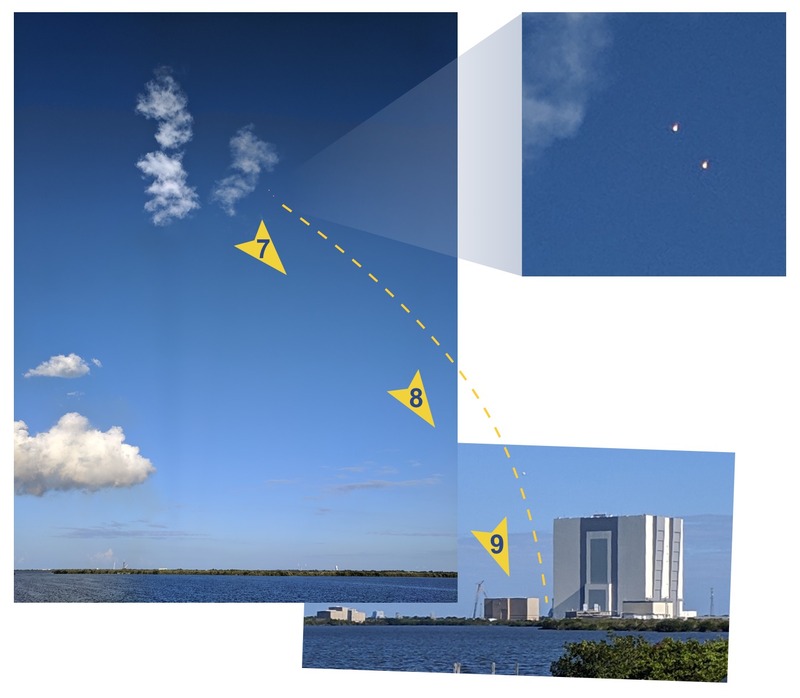 Fifty two seconds after the landing, a quadruple thud of sonic booms hit the crowd at Banana Creek, who were all too happy to erupt in cheers yet again. Download the press kit PDF for your launch and have it ready on your phone. It spells out the exact times of all the events of the launch. Use that and the countdown clock (which counts up after the launch) to prepare to spot events as they happen. You don’t want to be looking away when boosters separate! Here is the Arabsat Press Kit. To see as much of the landing(s) as possible, sit at the top of the bleachers South of the Saturn V Center. To avoid having your view obstructed by the tan building, don’t sit in the Northern most bleacher. I was at the South side of the second bleacher and saw as much as you can see from Banana Creek. Trees and other things will obscure the view as you sit further South. Ignore the livestream that they are showing on screens. It’s a distraction. It’s as much as 30 seconds behind and buffers a lot. The sound, sights, the ambiance are each thrilling and together they are more than the sum of their parts. Viewing a launch live is unlike anything I’ve experienced. And like any good experience, there is no substitute. No blog post can convey the complete experience. You have to go for yourself. Aerospace Engineer turned sofware developer and bootstrappin' entrepreneur.